Are you new to preserving food — or maybe just curious about it? Maybe you’d like to give it a shot, but don’t really know where to start. I was in your shoes last year! It was my very first year preserving food for my family. I had no idea what we would realistically eat in a year, given availability, and definitely didn’t plan it as well as I could have! Many things ran out with months yet before the next season, and some things are still sitting in my pantry, hardly touched! But I learned a lot from it, and will plan better this year. To some extent it’s simply a learning process, and you will have to adjust a little each year as you figure out what your family likes (and what’s available in abundance that year, if you add additional family members, as small children get bigger, and so on). Hopefully, though, you can learn from some of my mistakes! Last year, I watched all my friends go strawberry picking and then go home and make (heavily white-sugar sweetened) jams and jellies. Tons of them. I was jealous! I wanted to get started on my preserving, too, and have pretty jam and jelly jars to look at. Thankfully, I didn’t. Jams and jellies just aren’t something my family ever eats. We don’t really serve any sandwiches or toast, and both my kids and my husband just will not eat them. It would have been a waste of time and money to have canned those. On the other hand, I should have been freezing strawberries for smoothies, because that we do eat a lot! Which brings me to my point — what does your family eat? And more specifically, what do they eat a lot of? There’s more, of course, but those are some commonly preserved foods. They can be preserved by traditional canning (heat), lacto-fermenting, or by freezing. You can even preserve some by dehydrating! What is your family really likely to eat, either from this list or from other seasonal offerings? We, for example, go through quite a lot of tomato sauce. Applesauce is also popular. Frozen strawberries, peaches, and blueberries (two of which I didn’t even do last year) are also popular. Write down whatever it is that you think your family would eat, and how you’d like to preserve it. How Much Will Your Family Eat? It’s worth noting that your family may eat more of something because it’s home-canned and it tastes so much better. I might buy canned peaches 4 – 5 times per year: really, almost never. But we went through the dozen jars I canned in less than two weeks because they were so delicious! Lesson learned. They may also eat more of something because it’s readily available. If you’ve got 4 dozen jars of applesauce in the pantry, they’re not going to hesitate to grab one if they want a snack. On the other hand, if you’ve only got a couple, they may say, “Hey mom, can I eat this?” before digging in. I know my kids were like that about the applesauce, and could sit and eat half the jar between them in a sitting! What do you cook with, and how do you do it? I had planned last year that we usually served about a quart of tomato sauce per week, give or take, for “main dish” meals, like stuffed peppers. Unfortunately I forgot that I like to add it to soups a lot, make pizza, and other “small” uses. The amount I’d planned to make didn’t even last us six months! I also wished, over and over, that I’d gone ahead and canned the diced tomatoes (I only did sauce and salsa) because I love to cook with those, too, and they just aren’t available in glass jars. I also wished I’d done some tomato soup, so if I needed a fast lunch I could have it…without resorting to cans of who-knows-what. Remember that you’re trying to (ideally) preserve enough to get you all the way until the next preservation season…not just enough to get you through the winter! There’s nothing worse than enjoying delicious, frugal food out of the pantry all winter…only to run out around April, before anything’s growing yet! You still have to eat through the spring and summer, and although fresh food is plentiful (bonus), there are things you may still want. Like that tomato sauce, or applesauce, or something else that isn’t yet in season. Preserve a little more than you think you’ll really need, especially if it’s something that your family eats frequently. Notice I did some things in quarts, some in pints. Choosing the size that best works for your purposes is important. I will can salsa, diced tomatoes, and other things I tend to use smaller amounts of in smaller jars. Foods like tomato sauce, applesauce, etc. that we use a lot of, especially a lot at once, I can in bigger containers. That’s important to reduce waste, since once you open a jar, it’s like anything else: it has to be refrigerated and used within a week or so. I didn’t do any corn, strawberries, blueberries, cherries, pickles, etc. at all. I had my reasons, although they weren’t very good ones. The next point explains that…. If you haven’t already, make yourself a list of the rock-bottom and common prices that you pay on your favorite items in the off-season. Whether you can buy it fresh, frozen, or canned — know what you usually pay. And know how much that buys you. A pound? A quart jar? etc. It’s imperative to know what your ‘best prices’ are. Preserving food may or may not make sense, depending on your off-season prices. I didn’t preserve blueberries because I’d been able to find wild, unsprayed blueberries for just $3/lb. through the 09-10 winter. The local prices were often higher than that, even for conventional! It didn’t make sense. 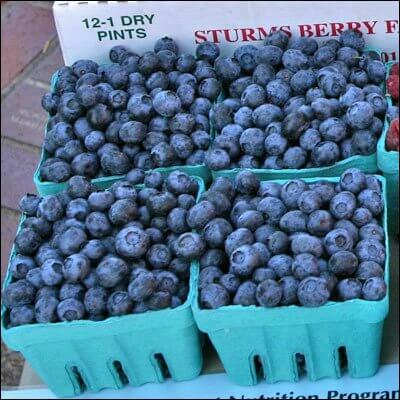 Unfortunately I lost my source in late fall and was unable to buy blueberries most of the time (because $5/lb. was the cheapest available for organic or unsprayed). On the other hand, I could have gotten strawberries (local and low-spray) for $1.80/lb. My rock-bottom winter price is $2.75/lb. I did not think to consider this when I was making decisions, and ended up passing on the strawberries because I “thought” I should only have to pay $1/lb. or less during the season of abundance! Too bad I didn’t realize how much I’d save. We go through at least 1 lb./week! This year I had a choice between local, low-spray berries for $1.90/lb. or unsprayed for $3/lb. It didn’t make financial sense to go with the unsprayed, unfortunately. Always check local prices against your off-season prices, so you know if it is worth your time! It’s important to know things like how many pounds of food goes in what size jars, too. Maybe you can find a quart of organic applesauce for about $5. It takes about 3 lbs. of apples to make that much applesauce, so you would need to find the apples for $1 – $1.50/lb. (or less) to make it worth your time. I pay about $3.75/quart for organic tomato puree, plus whatever spices I add to it — let’s call it $4.25. It takes about 3 lbs. of roma tomatoes or 4 lbs. of “other” tomatoes to make a quart of sauce. That means I need to find them for $1/lb. or less. Luckily, I have been able to find $0.50 – $1/lb. on both these items, so it’s worth it to me. It’s also important to be realistic on prices. Yes, on some foods you can find $0.50 – $1/lb. It’s even more likely if you’re able to purchase “seconds” from a farmer (overripe, funny looking, etc. but still edible). But some foods just aren’t that cheap. And they do fluctuate by area. I’m lucky to find blueberries under $3/lb. even if I buy in quantity. Strawberries hover close to $2/lb. Pears do too. I skipped out on a lot of foods last year because I just had not anticipated how much it would actually cost! I’d initially hoped to spend just $200 – $300 to preserve a whole year’s worth of food. Ha ha ha. It just doesn’t work that way! If I’m planning to feed my family for a year, I need to remember what I’d usually spend on (those) foods, and then maybe plan to spend 50 – 60% as much. I also needed to include the cost of the jars and lids, too, since it was my first year. I wasn’t really able to find amazing deals on jars — many of the ‘second-hand’ prices were the same as or more than just buying the jars new! Again, know your prices! Sit down, write out what your family eats, how you’d like to preserve it, and run the math to find out what’s really worth your time and money. Take your best guess! And in a year, you’ll know if something went really fast…or didn’t go at all. Then adjust and try again. It’s so rewarding, even though it does take some time to do! What do you preserve, and how did/do you decide what to do? This was a great article and so very helpful. Usually, I try to preserve anything I can get, especially that which is given to me. If I have to pay for it, I usually do less. Thank you for the info. This will be my first year preserving (other than some frozen veggies last year), so this will be immensly helpful! This is going to be my third year of preserving and I just can’t get enough of it. My first year was the first garden I have ever done and just froze what we couldn’t eat up. The second year I created an excel spreadsheet bought a canner and jars and let the word out that I wanted as many jars as possible. I was able to can a lot of food and it was a lot of fun with still freezing the usual suspects. This year I would like to do even more. We still have a few things left but not nearly as much as I wanted. I like having everything in a spreadsheet so I don’t have to remember what I did from year to year and it helps me remember what my family liked and didn’t like and what we need more of. Great post – thank you so much! This will be my first year preserving lots of food for my family. What I really need is some idea of just how many tomatoes you need per pint or quart, or with other produce. Does anyone know of some sort of table that tells you what you need to start with to end up a certain amount of the finished product? @Jessica, Here’s a chart that I used as an initial guideline: http://www.pickyourown.org/info.htm It’s not perfect, but it should give you a good starting place! This was a really helpful explanation of the process, and got me thinking again about my own choices even though I’ve been canning and preserving since 1992. I do want to make one suggestion regarding the kale. I tried steaming and freezing mine and found we didn’t use it. However, I have been using the dried kale, throwing it into ricotta mixtures and soup. It doesn’t have a strong flavor which means the kids think it’s just another spice. So for drying kale, do you just wash it and then dehydrate it or do you need to blanch it or anything like that? I didn’t info when I did a quick internet search. @Jenny in CG, I just washed it, dried it off, and put it in the dehydrator. I think I used the same temperature that I use for herbs, maybe around 125 degrees. Good article about planning to preserve food. I have a question. How do you store your canned food (jars on the shelf) or put back into the box and label the boxes and use as needed since there are so many jars? After the jars are opened and the food used and you clean the jars, how do most people store the used jars? Put an old lid on? Store the used jars in their original boxes and stack them up? Where do you put them? I have a small kitchen. I need to know how to plan storage spaces. @Nancy, I keep all of my extra jars in their original boxes (or sometimes in whatever boxes I can find if they didn’t come in boxes) down in my crawlspace under the stairs. It isn’t super accessible, but it works for me, because there’s no way I could store the hundreds of jars that I have in my kitchen. When I used to have a garage, I simply stacked the boxes in there. @Nancy, I stored a small amount (4 – 6 jars) in my kitchen on a counter, to use if I bought dried beans or something else I’d like to store in them. I also use them for yogurt and stuff, so having a couple extra on hand was nice. The majority are in the basement though, stacked in boxes. We will have a set of metal shelves in the basement right next to the stairs where we will store the majority of the full jars this year, with a few of each food in the pantry too. I have a small pantry area so that was a concern for me too! @Nancy, We’re in an apt with a small kitchen – with no extra storage places available. I store my jars in the back of the bottom cupboards. I put the full jars on the bottom and stack the empty jars on top of them with no lids. I have the used lids and rings in a gallon ziploc under the sink (cause that’s where it fits). It helps to keep the jars in their boxes so you can pull them out easier from way in the back. But I do still feel like I’m playing tetris when I get things out. Oh, I keep a few of each kind in the front of the cupboard by the pasta etc so it’s on hand, but the rest of the batch is way in the back. My biggest small space tip is to make sure you’re using all your vertical space. Good luck! One factor that I do not include in the cost of canning is well, the cost! I don’t can to save money. While I do save money, the cost savings for me is that the food is in glass jars and I know exactly what’s in the food. Much of it is local, organic and picked just before processing. I always do salsa – we never have enough and I give a bunch away. I need to make more this year. We also do freezer jam, which we do run out of, but this year I did 24 pints – so I’m giving some of those away too. This year we’ll expand to more tomato centered things – sauce, paste, diced. I also used up all the shredded zucchini because I bake bread about once a week – so sometimes it’s carrots, zucchini or banana – depending on what I have on hand. Based on my zucchini harvest so far – I’m going to have a TON of zucchini to work with! I found the canning jars at WalMart were cheaper than yard sales. You can get a dozen jars for $7-$8 dollars during the summer at most “big box” stores. Bonus, you know they are clean and food-safe. I’m reluctant to purchase used jars unless I knew the source directly and knew what they kept in them – I’ve seen people use canning jars for cleaning chemicals, paint, tools and misc. @Rebecca, I found that, too, and bought most of my jars at Walmart last year. I really liked the ones I got there. I bought a few at Good Will, and got several from my MIL. But my “rock bottom” price on jars was around $0.67/jar from Walmart, so why bother spending more at garage sales and such? At least in my area, more people WANT canning supplies than are selling them (most of my friends are getting into it) so it’s hard to find used anyway. I have also heard of Big Lots carrying jars, if you have one near you, and they would be cheap there. It’s okay to start out just doing a few dozen though and work up as you go! And don’t forget about clearance sales in Sept/Oct, that’s a great time to buy extras for the following year. @Laundry Lady, I bought most of my jars at Walmart or at Reading China and Glass. As I got into canning more, I did a better job of keeping an eye out for canning supplies on clearance at the end of the summer. New jars are less likely to have cracks, but it’s important to check all jars before using them. I just lost a jar of strawberry jam in my canner this week, though I can’t remember the last time I had a jar break, and I’ve been canning since 1992. Check online for deals, too, and save up those swag bucks! I just started doing this. I am keeping a list on my computer so I can reference it during preserving and as I run out I want to put the date so I can do adjust how much I do next year. I do know that we have spaghetti every week so that makes at least 52 jars. Thats a whole lot of tomatoes. Great post! I need to keep track of what I can each year! I just can as long as there is stuff to can! 🙂 We seem to eat a LOT of tomato based products so I can a lot of tomato juice, sauce, chunks, and veggie soup. If you are still on the market for a salsa recipe, this has always been a family favorite of ours (and my mom’s). @Shannon, Thanks! Out of curiosity, have you ever tried reducing the sugar? And what kind of vinegar do you use? I have pickles–bread and butter, sweet and spicy, and dill; salsa–mild and hot; tomatoes–canned and frozen; strawberry and apricot jam; frozen strawberries and apricots; and apple butter (found a recipe for the crockpot that doesn’t use sugar) so far. I’ve helped my mom preserve black-eyed peas and pickled beets. I’m hoping to find more tomatoes at a reasonable price because I’m not even close to having enough put away until next summer. Loved reading the article, but I was surprised at the prices of the fresh fruit that you mentioned. Are these U-Pick prices? We pay about $1 per lb. for fresh, low-spray or no-spray blueberries, but it is U-Pick…which is a fun couple of hours for everyone since we all work together and eat together while picking and just have fun! Strawberries (again, U-Pick) in our area for no-spray are around $1.25 a lb., so again, a better deal than what you mention. We live in the Pacific NW, so maybe that’s the difference. Or maybe your area doesn’t offer U-Pick. I don’t know. Our prices in the grocery stores seem higher here than what I see on other blogs, but our U-Pick prices are still pretty reasonable and make it cost effective to can and freeze. For those who are concerned about the initial upfront costs of canning, yes, it’s there. But if you pro-rated those costs over the lifetime of using your canning supplies and tools, you’ll find it to be surprisingly low and not really an issue. But the first year, it can be daunting. If you belong to a church or service organization, you may want to ask them to send out an email to everyone asking if anyone has canning supplies and jars that they are no longer using. You can sometimes find great deals (free or low cost) that way. @Julieanne Miller, I agree about the fruit prices, but it must really depend where you live, because I know that Kate does a lot of research on her food prices and sources. For me, on the West Coast (I don’t know where you are Julianne, but I’m in BC, Canada, not far from Seattle), berries are plentiful and cheap. I can get u-pick blueberries and strawberries as cheap as $1/lb, or at least $1.50/lb. Raspberries more like $1.60-$1.80. Blackberries are free and wild everywhere. Tree fruits like apples, pears, cherries, plums, etc. all get very cheap as well in season. @Julieanne Miller, I’ve been told that berries, especially, are hard to grow in this area (Ohio). It’s almost impossible to even FIND no-spray berries, and I’ve heard this from committed organic farmers! I think this highly affects the prices that we get here. I was able to find strawberries in Amish country for $1.50/lb. with ‘seconds’ for around $1/lb. (which I bought!). I’ll be checking there again in a month or so for blueberries, elderberries, etc. Unfortunately u-pick, while it does exist, doesn’t help much. One u-pick conventional blueberry farm we visited last year (probably the biggest in the state) was over $3/lb.! But yes, I think the weather and what grows easily makes a big difference. Tomatoes and apples grow really well, hence I often find those for $0.50/lb. Yeah for you, Kate! My MIL told me we were canning and freezing fruits and veggies shortly after I married into the family (30 years ago). It was so fun to learn to do it with her and she gave me some of the food! My husband, 10 yo daughter and I just finished freezing about 12 gallons of strawberries and will do jam next week. Next comes the wild blueberries. In August, we will can mostly fruit and tomato soup that’s like the tomoato-8 veggie drink at the store. Oh, and more pickles are absolutely necessary! Last year a lovely lady found out I want to try pickles and gave me the cukes, dill and the peppers along with her recipe-My son raves about her cooking at camp and now her pickle recipe! I’m finally going to try pressure canning veggies this year. I’d encourage everyone to try at least one or two new things a year. Don’t think that you have to do it all today, but do try it with someone you love because it’s lovely to visit as you work! @Monica, I think you might have more strawberries than I do! I have around 55 lbs., which I think fills 9 or 10 gallon-sized bags. I got about 16 – 18 lbs. of cherries (a mix of sweet and tart) and I’ll be aiming to do 25 – 30 quarts of lacto-fermented pickles too. Luckily we have a second fridge now (and 2 extra freezers! One of which is almost full already…) so we’re definitely expanding our operation this year! I love preserving food for my family. So far this year I’ve frozen 5 gallons of blueberries, 2 gallons of cherries and 2 gallons of strawberries. I’ve also canned 21 pints of cherries. We still have plenty of jam from last year so I’m taking a break from ajm this year. I’m looking forward to canning some more tomatoes (whole, sauce, chopped), salsa, peaches and pears. I also plan to freeze corn, I canned it last year and did not care for how it turned out. Last year I only did one batch of pears and my daughter wound up eating them all in under a month. Hopefully this year I will get to at least try some of them. Thank you for this post! This is my first year canning (I’ve always just frozen fruits and veggies before now) and I’ve been enjoying it, but I’ve been trying to figure out how much we need to can to last us through next year. I’ve already done blueberry jam and watermelon jelly (because I do eat organic peanut butter and jam/jelly sandwiches often), a few jars of peaches, and 10 jars of pickles. We grow some of our own veggies and we have TONS of cucumbers, so I’m about to make some more pickles and sweet relish this weekend to use up more of them. Luckily, I love pickles and eat them all the time! I’ll also be getting some more peaches from the farmer’s market this weekend to can some more of those, and I hope to try making applesauce this fall. Next year, I’m planning to expand into pressure cooker canning to do more veggies. I figured I’d start slow and just do the water bath canning for now to see how that turns out. I’m loving it so far. The cost of the jars is the downside at the moment, but I’m hoping that will trickle off over the years as I reuse them and build my jar collection. I still do some freezer preserving: I have lots of strawberries we picked in May along with okra from my grandma’s garden and broccoli, squash, and corn from the farmer’s market. I like knowing where my food has come from (either my own garden, my grandma’s, or local farmers) and how it was made and preserved. Lots of good info here but I have to jump in with one safety comment – as a long-time canner I advise newbies to find a local class to learn the basics or read the tried and true canning books ( like the Ball Blue Book.) 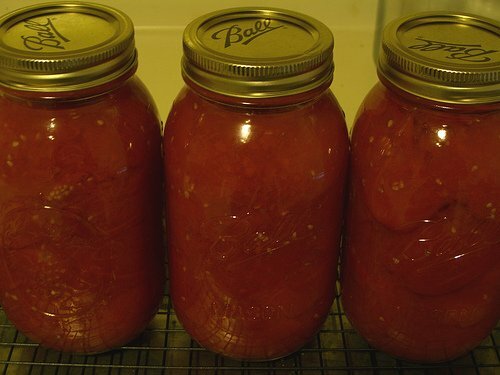 I love your cooking recipes Kate, but your tomato sauce recipe is not safe for home canning. 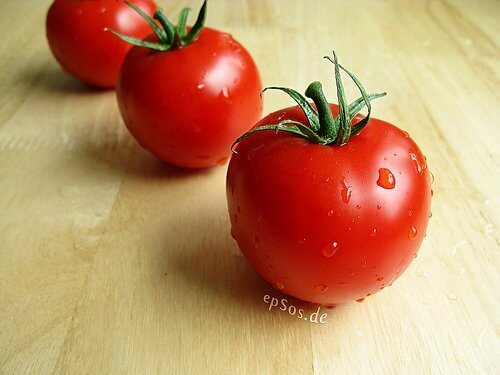 You add oil which you should never do for home-canned products (spoilage) and you don’t add lemon juice which you should always do for home-canned tomatoes to increase the pH of the product to a safe level. This recipe is fine for freezing but not safe for canning. I have no problem finding canning jars for FREE! Many of the elderly in our church just don’t can anymore or they don’t can in quart jars because of now cooking for only 2. Put the word out and you will be surprised at what gets offered to you. Also, many of those same folks lent me their equipment the first year or two. I did have to work around their need/use and use it when available but if cash outlay is an issue for you like it was for me, it will be worth it. I always try to gift the generous folks with a jar or two of some of the yummy stuff that I have canned. @Jenny in CG, Oh, you reminded me things can be reused too! I don’t have any “jar holders,” I just stuck a quilted pot holder at the bottom of my pot to protect my jars. And I used my big 16-qt. stock pot, not a dedicated canning pot. That cut down on costs, and no, I did not have any jars break! Hard red wheat berries (have some). Vital wheat gluten/dough enhancer, maybe. SAF yeast (but that goes in the freezer). Garlic – aim for about 70+ cloves. Store in garage for as long as possible. 20-40lbs various winter squashes – store in garage, try butternut, acorn, spaghetti (at least several of these), delicata. Onions – 70-100 fresh, store somehow in garage. Kidney beans – grow as many as possible, and can up at least 7 pints to try out. 14+ pints would be awesome. Carrots – if I make a crate and find some sand, I’ll try doing the live storage thing. If that doesn’t happen, meh. Apples – 50-200lbs in the garage. Try to find as many Granny Smith, Idared, and some other good storage apple for this. 1/2 cow. Mostly steaks, some stew meat, ground beef. Spinach – a dozen half-cups frozen. Jams. Strawberry. Seedless raspberry. Blackberry. Raspberry-Blackberry. Raspberry-Strawberry. Huckleberry. Grape. Strawberry-Rhubarb. Chocolate seedless raspberry if I feel bored. Sliced strawberries – 6 quart bags. Trout/Steelhead/whatever – whatever hubby can catch. Corn on the cob – 4-7 gallon bags. Zucchini – 6-12 cups in one-cup portions. Thanks, I loved this article! We pick our own, unsprayed, locally-grown blueberries at a farm close to us and we discovered a wonderful recipe for the blueberries that I really should have made more of- spiced blueberry sauce- basically it was blueberries with some water, a LITTLE sugar, a cinnamon stick, some peeled lemon zest and juice, simmered together, then remove the cinnamon and the zest. I tipped it into sterilised jars while they were hot and it was YUMMY! Kept well in the cupboard unopened and we had it on crepes, ice-cream, in milkshakes, etc. It was delicious!! And it made quite a good amount of sauce for the blueberries we used! Great article! We can a lot of foods as well. We are military and move around a lot so it depends where we are that year on what we can. We are in FL now and will be canning tomatoes (.60lb for organic) and we canned 80lbs. of apples earlier that we purchased for .65 lb. The summer is Florida’s “off season”, so there isn’t much to buy until Oct./Nov. through May which happens to be the growing season. It’s so much different than what we are used to, but it’s kinda nice. This was SUCH a great article! Thank you! I’m just entering my first year of canning so I’ll be like you next year–evaluating what we did/didn’t use. Thanks for the tips! How do you even began to can after you have done all the preparation? What supplies do you need besides the jars? @Crystal, The most important supplies are the canner (the large pot), the jars, the screw lids, and the dome lids (the flat ones that seal). Other than that, I would say that you need a jar holder (so that you have something sturdy to use to pick scalding hot jars out of the water). A funnel is useful, and same with a magnetic wand for picking up hot, sterilized lids, but neither one is absolutely crucial.